Originally in f# minor, transposed here to d. Schubert completed only a part of the movement, and we have provided a new completion. 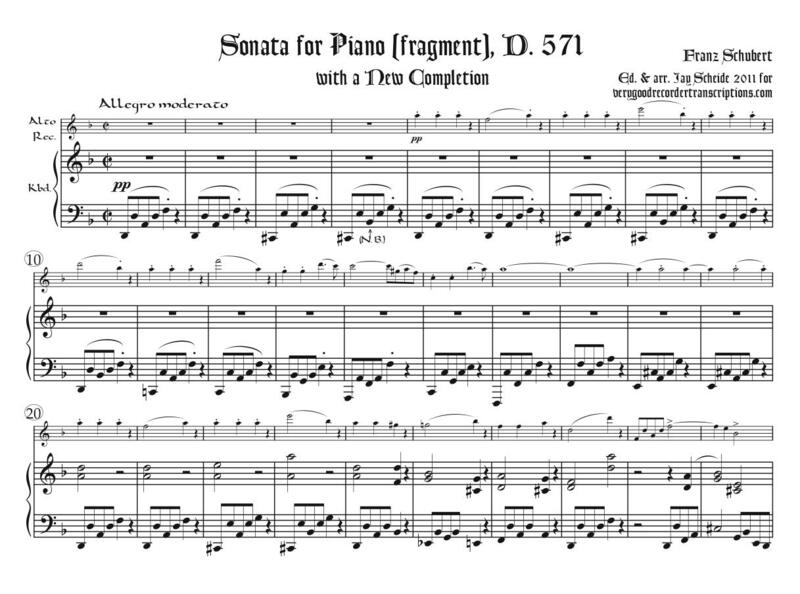 According to William Kinderman, this sonata fragment “from 1817, as Dieter Schnebel has observed, already displays that uncanny suspension of sound and time so characteristic of many later Schubertian works….As the bleak melancholy of F sharp minor [here D minor] gives way to the brighter tonal sphere of D major [here Bb major], the flowing figuration and subtle harmonic nuances enhance the change, elaborating the sound as if in resistance to the inevitable passage of time or the transience of life itself.” (In The Cambridge Companion to Schubert, 1997, ed. C. H. Gibbs, p. 156.) My (arranger Scheide’s) own feeling about the opening is that the melody appears like a lone star in a night sky. Revised April 19, 2018. Recorder & Keyboard part, 10 pp.